On February 10th, Google announced that they would be building out 1 Gigabit speed fiber optic network. They were looking for applications and nominations from communities around the country to help them decide where they would build out this insanely fast network. Nick Kuzmin, our IT Guru here at Mindscape, saw this and mentioned to me that maybe he’d build a Facebook fan page about it later that day. I thought it was a great idea, but also knew that with ideas like that, time is an important factor. If it lingers, it might not happen. The best way to implement a great idea is to implement it right away! Ten minutes later I was the first fan of our new group and Nick and I had spread the word to the few hundred friends we have on Facebook. We didn’t expect what happened next. Nick spent some time getting in contact with the city of Grand Rapids IT department and also with Douglas Lang at the Grand Rapids Technology Partnership (http://www.grtp.org). I doubt we were the only ones in contact with the city, but I think we helped get it moving. A few days later, we crested a 1000 fans, and the city had put in their official bid. Since then, it has been exciting watching the Grand Rapids community get behind this possibility. Two weeks later, we were over 5300 [we hit 37,000 by March 26th and were the largest Facebook group of its kind in the country] members, and trailed only Topeka, Kansas for total members on a Facebook page about Google Fiber. Many community leaders have gotten involved, and taken it upon themselves to organize meetings and find creative ways to show Google how much our community wants and can utilize their new network. Mindscape at Hanon-McKendry knows about social media. Nick and I, though we work here, are more involved with the technology side of what we do and haven’t had a chance to see the power of social media first hand. I haven’t ever had this much fun (or had this sort of excuse) checking Facebook on a minute by minute basis. Great work Grand Rapids! 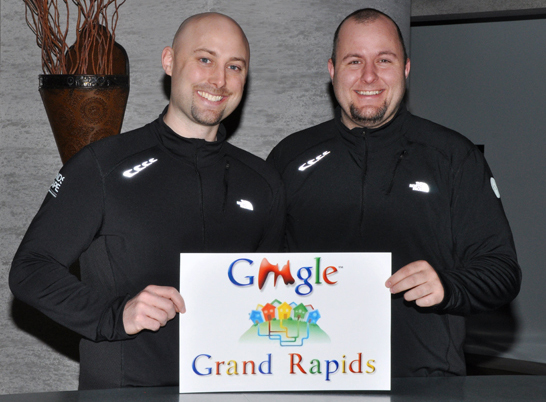 Why should Google come to Grand Rapids? Grand Rapids is a hard-working, strong community. Our city prides itself on our amazing health care facilities (we’ve dubbed Michigan Ave the “Medical Mile”). The potential benefit to the medical community would be immeasurable. We also support the arts — Festival in June (this year with be the 41st! ), Art Prize in the fall (last year was the inaugural event). Faster internet speeds would give artists a greater chance to share their work. We’ve recently begun to increase our participation in the motion picture industry. Our partnership with Google would make the city even more appealing to location scouts. And I can’t forget to mention, this community supports the fiber network! There is a buzz about the city — meetings are being planned, discussion forums are, well, discussing. The people of Grand Rapids are ready and willing to help in any way we can! What can Google Fiber do for Grand Rapids? More choice in internet providers!